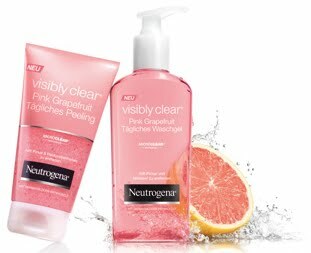 Like a month ago I started using the Neutrogena visibly clear [Pink grapefruit] Facial wash & Dialy scrub. By just smelling it I was in love, but I also noticed over the weeks that it is great for my skin. Normally I only take care of my skin with a normal scrub & the vanishing cream from Lush. Because every other product gives me a break out. Even though I have to admit that I also got break outs from these products in the beginning. But more the kind of throwing out all the dirty in my skin break outs, because after those break outs are gone I always have a very nice clean skin with no acne at all. The reason I still have some small 'break outs' is because once a week I don't use neutrogena but the garnier pure active exfobrusher. I do this because that product cleans up your skin really deep & I don't want to over use one product. 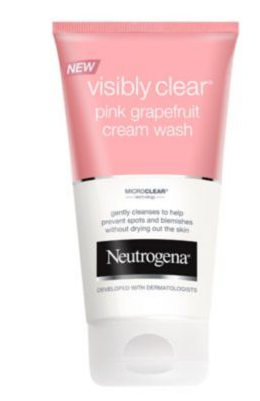 But that's kind of the downside of these products, by Neutrogena, because when you skip a day the next day after using it again I always have some acne. The back of both neutrogena products say the exact same thing: that you should use it in the morning AND the evening. But because I have very sensitive skin I didn't want to use it twice a day. And that's when I decided to ask my sister to also buy me the cream wash. So when I got the cream wash I noticed that the directions of using this product are the exact same as on the facial wash & the daily scrub. But I was actually really suprised when I used the cream wash.
First it heathed up a little, especially on certain areas of my face. But after I washed it off, my skin felt really soft and not tight at all. So I was really glad that I got the cream wash to. Especially for the mornings, I always hate to use a cream in the morning because it makes my face feel sticky. My skin has really improved since I use these products. Which is kind of special because I have a very sensitive skin and most products give me huge break outs. & besides that Neutrogena isn't expensive at all ! I believe this is everything I can say about the products I use from Neutrogena. Besides if you have trouble with scrubs because most of them are to harsh on your skin, than I should definitely try the dialy scrub. It's really soft and it barely feels like a scrub, but it does scrub your face if you know what I mean. All pink & lovelyness in my bathroom.